Preheat oven to 350°. Using a pastry blender or two forks, combine flour, brown sugar and butter until crumbly. Remove 1 cup of mixture and reserve. In a separate bowl, whisk milk, egg, baking soda and extract. Stir into flour mixture until combined; pour into a greased and floured 13x9-in. pan. 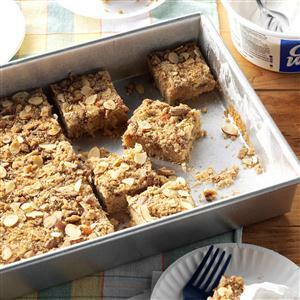 Top with chopped Heath bars, almonds and reserved flour mixture. Bake until a toothpick inserted in center comes out clean, about 30 minutes. Cool on a wire rack. Cut into bars. If desired, serve with sweetened whipped cream or vanilla ice cream. Yield: 2 dozen.